This advanced example demonstrates how to warm start PROC OPTMILP by using the PRIMALIN= option. The model is constructed in PROC OPTMODEL and saved in an MPS-format SAS data set for use in PROC OPTMILP. Note that this problem can also be solved from within PROC OPTMODEL; see Chapter 11 for details. Constraint (assign_def) ensures that each customer is assigned to exactly one site. Constraint (link) forces a facility to be built if any customer has been assigned to that facility. Finally, constraint (capacity) enforces the capacity limit at each site. We first solve the problem for the model with no fixed charge by using the following code. The first PROC SQL call populates the macro variables varcostNo. This macro variable is used to display the objective value when the results are plotted. The second PROC SQL call generates a data set which is used to plot the results. The information printed in the log by PROC OPTMILP is displayed in Output 18.3.1. NOTE: The problem has 560 constraints (510 LE, 50 EQ, 0 GE, 0 range). NOTE: The problem has 2010 constraint coefficients. NOTE: The OPTMILP presolver removed 10 variables and 500 constraints. NOTE: The OPTMILP presolver removed 1010 constraint coefficients. NOTE: OPTMILP added 3 cuts with 172 cut coefficients at the root. 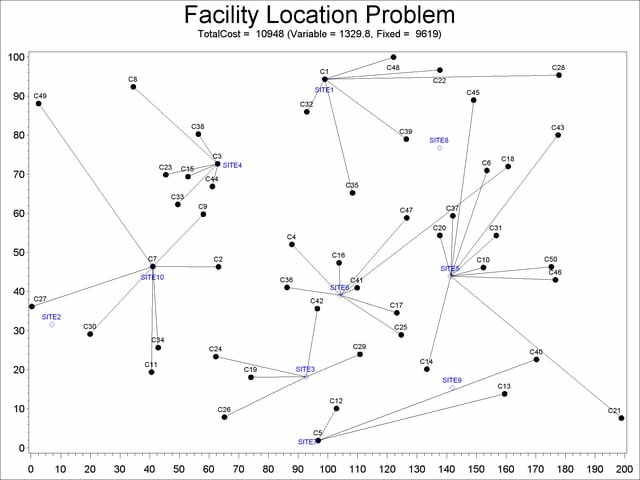 NOTE: The data set WORK.NOFCOUT has 510 observations and 8 variables. Next, we solve the fixed-charge model by using the following code. Note that the solution to the model with no fixed charge is feasible for the fixed-charge model and should provide a good starting point for PROC OPTMILP. We use the PRIMALIN= option to provide an incumbent solution ("warm start"). The two PROC SQL calls perform the same functions as in the case with no fixed charges. The results from this approach are shown in Output 18.3.2. NOTE: OPTMILP added 20 cuts with 2249 cut coefficients at the root. 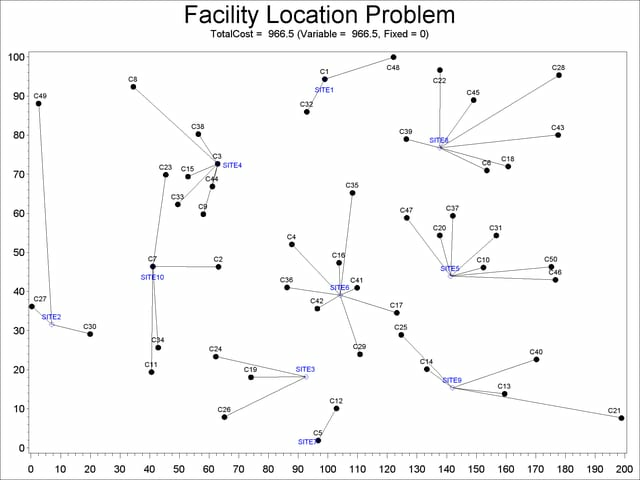 NOTE: The data set WORK.FCOUT has 510 observations and 8 variables. The following two SAS programs produce a plot of the solutions for both variants of the model, using data sets produced by PROC SQL from the PRIMALOUT= data sets produced by PROC OPTMILP. Note:Execution of this code requires SAS/GRAPH software. The output from the first program appears in Output 18.3.3. The output from the second program appears in Output 18.3.4. The economic tradeoff for the fixed-charge model forces us to build fewer sites and push more demand to each site.